Earlier today, we dug up some info on an alleged Galaxy A6 and A6+ pair, currently in the works. 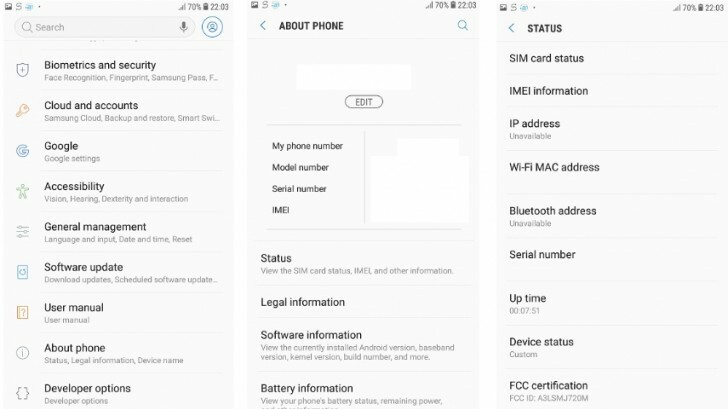 Some extra snooping around also led us to interesting finds on a few other Samsung devices, all bearing the SM-J720 model number, in a few typical variants - M, D/DS, F and F/DS. Examining current and old J-series model numbers leads us to believe this is likely the Galaxy J7 (2018). On to particulars, then. FCC documentation is rarely very descriptive in terms of internals, but it does cite exact dimensions for the device - 153mm x 76mm. With diagonal measurement set at 162mm for the entire phone and 140mm for the display. That translates to a 5.5-inch panel. It was also brought to our attention that a few SM-F720 devices recently received their Bluetooth SIG and Wi-Fi Alliance certifications. This only further cements the likelihood of a US release, but doesn’t really provide much extra info. Luckily, GeekBench seems to have more than a few listings for the SM-J720F. All of them with nicely converging scores and reporting 3GB of RAM, an Android 8.0 environment and an Exynos 7885 chipset, clocked at 1.6GHz. Some specs on the latter chip were leaked a few months ago. These include two Cortex-A73 cores, plus six small A53 cores and a Mali-G71 GPU, all built on an efficient 14nm development process. The Exynos 7885 is yet to be officially announced, but has also been spotted powering what appeared to be a Samsung Galaxy A5 (2018). A few other bits and pieces of information are also worth noting, although we can't exactly say if they fit anywhere in the bigger puzzle. For instance, one of the FCC letters states that the only difference between the SM-J720M/DS and SM-J720M is the SIM tray. That could explain why some Bluetooth certification documents refer to the test subject as "J7 Duo". Alternatively, "Duo" could also be an actual model name on some markets. If that is the case, we also know that Samsung has procured the "Galaxy J7 Crown" and "Galaxy J7 Orbit" trademarks in the past. But, if and how that all fits in is anybody's guess. Yeah, I'm thinking exactly the same! Something seems to have gone amiss. Now 16:9 confirm .. What do you think now . It has an 18.5:9 aspect screen. Can't compare with a 16:9 screen. Seriously.